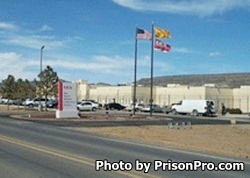 New Mexico Women's Correctional Facility is located in Grants New Mexico and is operated by Corrections Corporation of America under a contract with the New Mexico Department of Corrections. This facility houses 611 female inmates of various custody levels. This facility places a strong emphasis on education, and inmates are offered vocational training, career counseling, life skills courses, parenting classes, pre-release counseling, and can even earn a GED while incarcerated. All visitors must be approved first by filling out a visiting application. Wednesdays, Thursdays, Fridays, Saturdays, Sundays and Holidays from 8:30am-3:30pm. Mondays and Tuesdays from 8:30am-3:30pm.